At $2.40 a 12 oz. 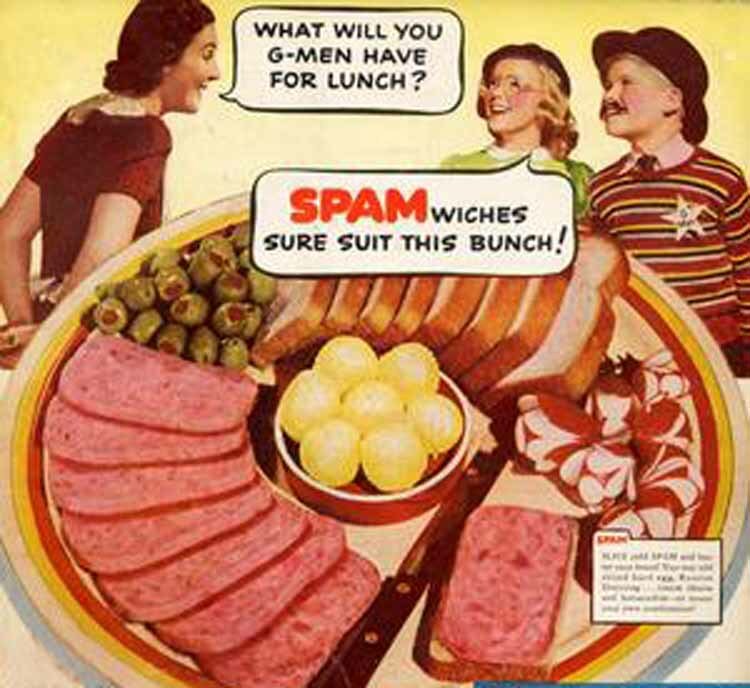 can, Spam is the food of choice for hard times. Spam has seen Americans through dark days. The factory workers at Hormel Food Corporation say they are making more Spam than ever, and it doesn’t look like it is slowing down. It seems that Americans are preparing for lean times–they are storing Spam in their pantries and basements. And I have a feeling in my “sixth sense” that things may get rocky. Still I can’t image being desperate or fearful enough to buy, store, and eat Spam. That’s not my food snob speaking; that’s my practical side: What about beans and rice or beans and corn? It is a great, natural source of protein. What an unusual place we sit in this season of Thanksgiving and Christmas–on the cusp of the unknown. And believe me, I am taking note, making mental pictures and memories as we enjoy the ravens, leeks, and garlic of Egypt this season. After the new year, things may radically change–or slowly change. But change is coming. President-elect Obama says he will turn the economy around. And a lot of people must believe him because they voted to give him a crack at trying. With all the hope that’s been shed abroad, and as President-elect Obama leads us to the Emerald City… why is everyone buying and storing Spam as we travel the yellow brick road? not just children of the 60’s ate that stuff… my family in the 70’s also fried it up. we ate mostly meat that my family shot (lots of deer, pheasants & duck) but when the freezers ran low, spam it was…. i think now, I would rather go hungry than eat it…. i know there is action in faith, but why are so many attached to fear of the unknown? I love your comment, Lamar … no canned laughter here – just a genuine chuckle! I’ve actually never had Spam. Sounds like I haven’t missed a thing. Ugh….immediate memories of my 6th grade cafeteria food….spam in every form imaginable…sometimes it was hidden in tomato sauce…rubber meat, yes!